This so-called ‘boy’ looks about 35. For once, I prefer the US cover. Sega Does exists not just to satisfy my eternal desire to review old Sega games, but to highlight smelly piles like DJ Boy. If you hail from the early 90s, but don’t remember DJ Boy, rest easy. It’s a sadistic beat-em-up that attempts to combine 80s hip hop street culture with a freewheeling Japanese mindset. And while that might sound like a retro lark worth experiencing, the reality is nostalgia worth forgetting. 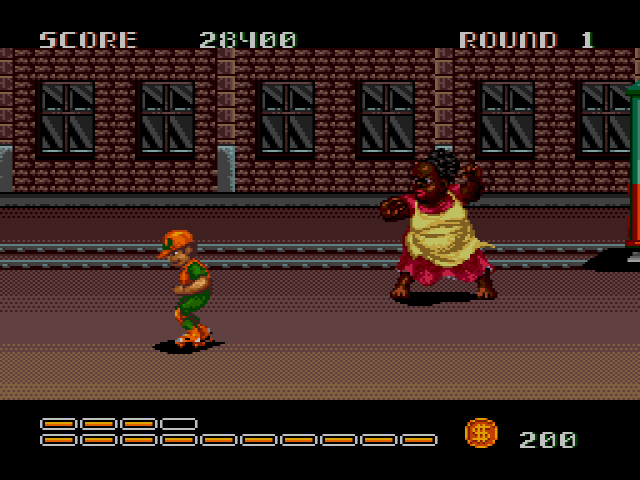 If River City Ransom‘s RPG elements and Streets of Rage 2‘s pulsating spirit elevated the beat-em-up genre to new heights, DJ Boy‘s sloppy mechanics contributed to its eventual end. Obstructing my field of vision? That’s a paddlin’. Even in 1990, Kaneko and Sega should have known better. Unlike other beat-em-ups which force you to use your legs like a sucker, DJ Boy lets you glide on skates with relative ease. While this is certainly better than walking stiffly with your fists close to your chest, the speedy nature of skates makes it difficult to line up your attacks. If the Boy isn’t completely parallel to an enemy before he attempts to hit them, his hit will not land. Meanwhile, the enemy can attack and flail all over the place and still manage to hit the Boy where it counts. DJ Boy silently judges the energetic dancer. DJ Boy starts the game as a weak honky, with only four life bars and one life to his ridiculous name. With each level beaten, however, more bars will be added to his life and you’ll have the option to purchase an additional life at the store. The store appears automatically at the end of each level, and once there, you can purchase items with coins obtained from enemies. Items range from more attack power and additional defense to life-refilling burgers and the aforementioned extra life. Even with this help, DJ Boy is shamelessly difficult, and particularly if you play on Normal. Regular enemies take three or four hits to go down, and bosses can take up to several dozen, depending on the size of their life bar. 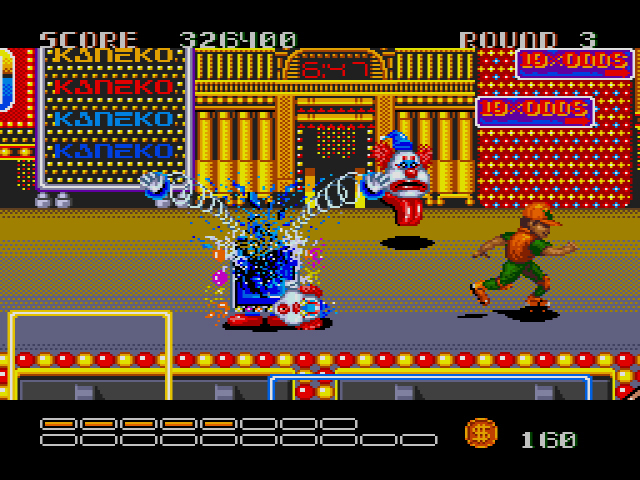 While one hit is enough for DJ Boy’s life bar to dwindle by one, bosses often require several hits just to deplete one bar from their life. Solution: if you must play DJ Boy, play on Easy. It might hurt your pride, but the game will be somewhat fair. After his brief visit to the Casino, DJ Boy never slept again. 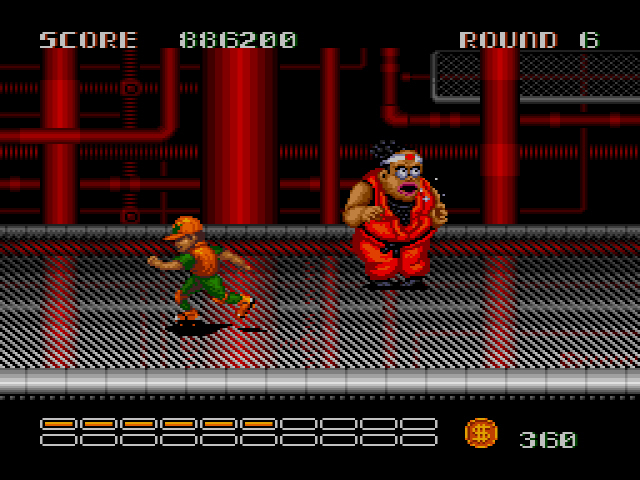 The level design mostly draws inspiration from previous beat-em-ups. Levels 1 and 2 have your stereotypical urban decay look. Girls throw dynamite at you from streetcars passing by, oil slicks slow your roll, and bowling balls tumble from the sky, as if God Himself was begging you to leave well enough alone. Level 3 is a Casino, and while there’s no gambling (you’re still a boy), there are lots of small mohawked clones in bell-bottoms threatening to skate into your shins. Level 4 takes place atop a construction site, and incorporates tricky platforming elements along side the brawling. Levels 5 and 6 bring DJ Boy to an anticlimactic close, with you fighting every boss again, followed by two new bosses. No fair, look at the size of those platforms! 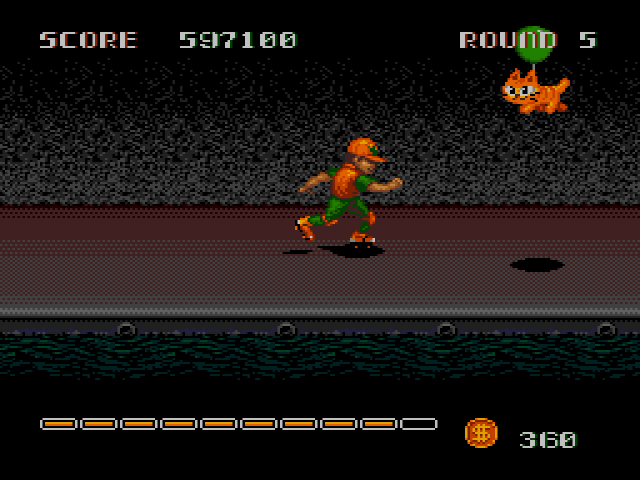 There are quite a few differences between the console and arcade versions of DJ Boy. In the arcade, you play as either Bob or Tom (Donald is nowhere to be found) and are on a quest to rescue your beloved boombox. The arcade is a simultaneous co-op, featuring obnoxious background vocal accompaniment from “Wolfman Jack” (not the legendary DJ, but a demonic imposter). 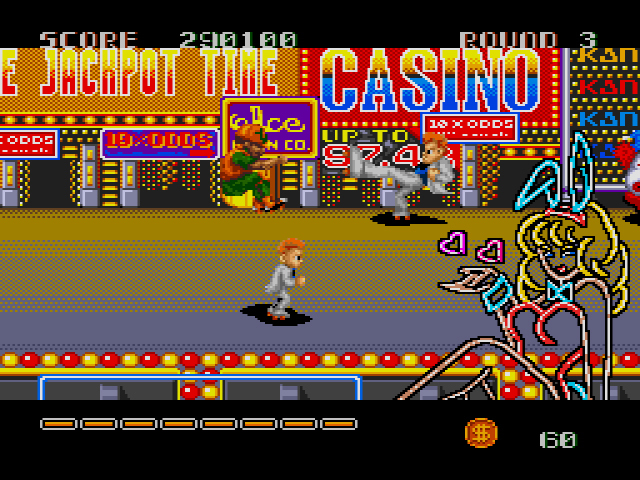 In the Casino stage, you’re actually in a Casino instead of skating on the outskirts. Rather than an all-boss bonanza after the construction site, you go to a Western stage. 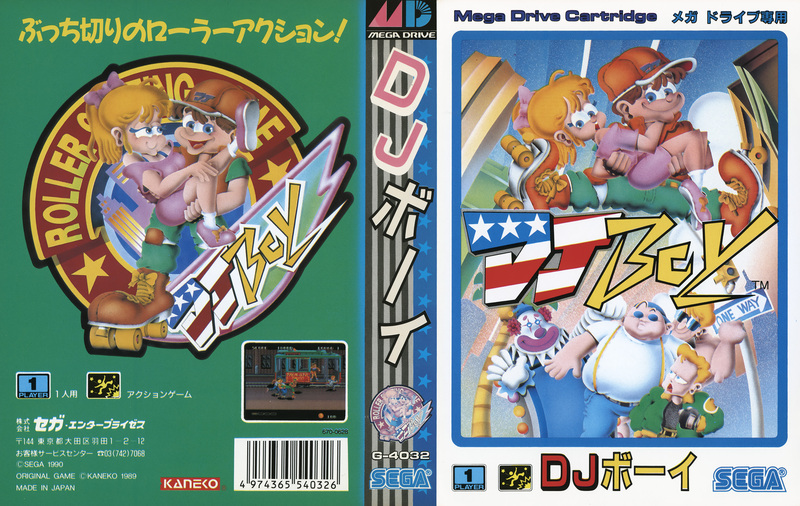 Judging by the Youtube playthrough I watched, DJ Boy Arcade looks like a more well-rounded game than its Genesis/Mega Drive counterpart. One final awkward boss fight for the road. Two turntables and a microphone? Only for real DJs. DJ Boy comes equipped with awful hit detection, insane difficulty, and little reason for being (why are the last two levels solely comprised of boss fights?). Donald J. Boy will never be a man at this rate. These wacky screenshots might pique your curiosity. I understand. Look at them, shake your head, and move on. DJ Boy is not the funky fresh hip-hop-em-up we want it to be. This comment is completely off topic so my apologies! First of all I’m glad to see you perevere in this crazy sega-endeavour! A billion timesThumbs up man!!! Though my lack of comments (The MD is much more uncharted waters for me than the Master System … As a result I have much less meaningfull things to say about it) might perhaps lead you to believe otherwise, I still read your every blog entry! The reason for me to check in now: I completed “Miracle Warriors” yesterday and feel an urge to share my thoughts on it (especially while they’re still fresh). Now I know you didn’t like the game very much and a long time has passed since you’ve reviewed it. So you perhaps don’t recall all that much of the experience. Still I hope you will grant me the favor of discussing it a bit further with you and the other readers. For better or worse, Miracle Warriors was after all the first JRPG to grace Western shores and its blog entry received above average attention in the comment section. So if you’e okay with my proposal, where should I post my thoughts? The blog entry of Miracle Warriors seems the most logical place. As I assume your blog will eventually fill in the role of historical catalogue of all Sega, future readers will profit from finding all relevant content (information, opinions) in one single place. On the other hand, I would very much like other readers/ commenters to weigh in on my perspective, and I’m afraid they won’t immediately dig up an older entry. So what do you think? Hey Pieter! Nice to see you again in the comments. I think if you just commented under the Miracle Warriors post, that would be fine. If people are interested in reading about that game, they’re likely interested in reading not only my thoughts, but others’ as well. I’m looking forward to reading what you thought of the game! I rented this one pretty early on after getting my Genesis. It was hard, but somehow I managed to go on a run and blew through the game without dying. 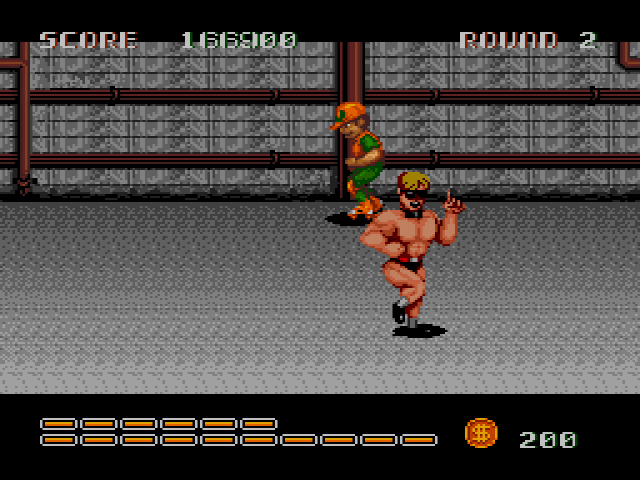 I loved beat em ups back in the day, and even then only thought this was okay. I actually never really thought about it much once I returned it. Also, I didn’t remember it being so racist. I mean I know they lightened up her skin for the US version, but I looked up a screenshot and it was still pretty bad. Apparently in the Japanese version, she attacks by farting at you, but for the US, they replaced it with her throwing donuts at you. Yeah, I’m not sure why the Japanese version is so racist. I know a lot of Japanese game developers are heavily inspired by American movies, television, etc. I wonder if they’re just cribbing from racist vintage American art? As a fan of beat-em-ups, I’ve always been curious about this one. I guess now that it’s become a bit more expensive, it’s a good excuse to either not pay much for it, or to avoid it altogether. I’d check it out on an emulator before committing too many cash dollars for it. 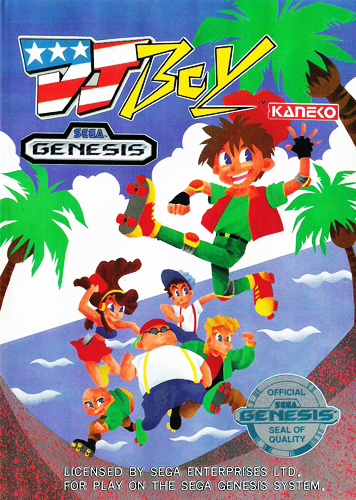 This game was probably my first big-time disappointment on Genesis. I used to play it at the local arcade shop and of course I saved up my allowance money to buy it when I saw it at a KayBee shop. I could have accepted the disappointing graphics and the tinny sound. I could have even accepted the difficulty. What I couldn’t get past was the lack of a 2-player mode! 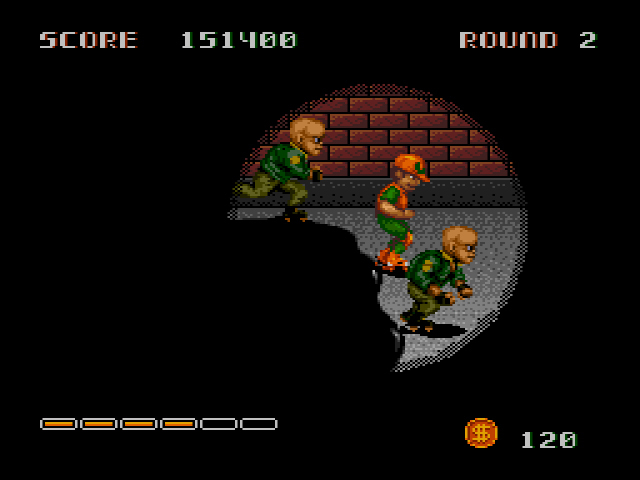 Back then I used to play co-op games with my cousin or my front door neighbor all the time, and a beat-em-up without a cooperative 2-player mode was better served as a doorstop!